Posted by Destin Real Estate Sales on Saturday, March 1st, 2014 at 9:17am. 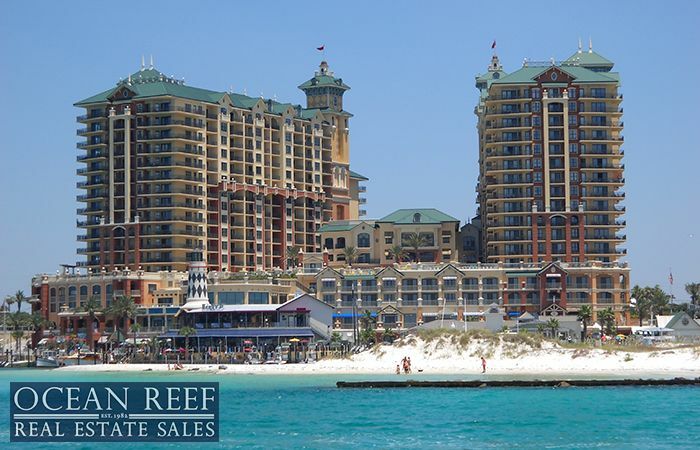 One of the most opulent architectural condominium masterpieces in Destin are the soaring twin towers of The Emerald Grande. Completed in 2007, this condominium doubles as a hotel with luxurious accommodations comprised of three and four bedroom rental units. Its landmark location overlooking the bridge that serves as a gateway to Destin on Highway 98 is situated on the harbor with views of the giant private charter fishing fleet and the pristine National Seashore, which extends five miles towards the west along Okaloosa Island. This is nestled between the huge expanse of Choctawhatchee Bay near Crab Island as well as the glistening Gulf of Mexico whose jewel toned waters extend all the way to the southern horizon. The Emerald Grande was deliberately designed to look like an old antebellum styled coastal resort which had been added onto in recent times with the addition of the two towers. The center is reminiscent of times gone by with giant classical columns that provide a gracious entry. The rest of the structure is complete with fairy tale like towers that are festooned with the kind of flags one might see fluttering in the wind on a European castle. The lobby of the Emerald Grande is breathtaking with high ceilings and a huge chandelier that resembles a glass antique globe. The intricate hardwood flooring is centered by a compass that is inlayed with brass, silver and black onyx. A rich comfortably furnished sitting area nearby is decorated with original oil paintings of sea life. Since nearly everyone arrives here by car, the developer spent a fortune on the public restrooms off the lobby that includes rare green onyx counters imported from an old opera house in Paris. The theme of a late 1800s seaside resort is evident upstairs at the Grand Vista Bar and Grill. This restaurant is casual yet country club comfortable with massive white beams, intricately cut multiple crown molded ceilings and a marvelous mermaid fireplace inlayed with oyster shell. An assemblage of old photographs line the walls in the adjoining and comfortably furnished living room with happy scenes of Destin fishing trips taken over the past 100 years. The Grande Vista level is exactly that since the sundeck that surrounds the pool and hot tubs sits sixty feet above the water below. There is also an indoor pool along with a 9,700 square foot European Salon and Fitness Center upstairs with walls of glass that offer stunning panoramic views. This facility has separate showers, steam rooms, saunas and a living area for gentlemen and ladies where they may relax after a workout or massage. Here you may enjoy a Sea Gull's eye view of East Pass where big yachts, sailboats and fishing craft go out into the gorgeous gulf. From the patio deck, the entirety of Harborwalk Village can be seen as well with its marina, light house, waterfront restaurants, bars and retail shops. On the “Sunset Deck” which wraps around the western tower at this same level brilliantly colored, spectacular skies may be savored as the sun seasonally sinks into the bay or gulf. The western tower includes regular “whole ownership” condos for sale while portions of the east tower has what are defined as “Fractional Ownership.” These units are less expensive but owners only are able to use them about six weeks per year on a revolving calendar basis. Currently there are twenty-nine three and four bedroom whole ownership units for sale ranging from $489,900 to $1,995,000. All of these Emerald Grande Condos come furnished so new owners may use them immediately after closing the sale or utilize them as a vacation rentals. The list price averages at $987,728. There is currently one 3 three bedroom under contract and it was listed at $450,000 or $360.39 per square foot. There have been two regular whole ownership sales during the past twelve months. These three bedroom units sold for $400,000 and $475,000 at an average of $437,500 or $242.21 per square foot. There are 41 less expensive Fractional Units for sale between $55,000 to $261,250. Twenty-three fractional units have sold during the past twelve months between $40,000 to $123,000. To learn more about condos for sale at the Emerald Grande and other Destin Real Estate oppportunities call us now at 877.392.6085.